Another year of mixed martial arts is nearly in the books, and now it’s time to start looking ahead to 2019. In this piece, MMA News columnist Adam Martin gives his five bold predictions for next year in MMA. For months now we’ve heard rumors the UFC could bring in the 165lbs weight class in 2019. UFC president Dana White has went on record to shoot this rumor down, but I’m not totally buying it. I still think there’s a good chance the UFC decides to bring in 165 and moves up the welterweight limit of 170lbs to 175lbs. With the UFC planning on doing even more cards now that the promotion is on ESPN, more title fights are even more important than they ever have been. Adding 165lbs adds another marquee title to the UFC, and despite White saying it won’t happen, I don’t quite believe it. I think we’ll see the super lightweight/junior welterweight division in the UFC in 2019. When the UFC traded Demetrious Johnson to ONE Championship for Ben Askren and started releasing some of the other flyweights on the roster, it seemed like a foregone conclusion the promotion was ditching 125lbs. Not so fast. Since the initial batch of cuts came out, the UFC has continued to book flyweight fights, including a title fight between champion Henry Cejudo and challenger TJ Dillashaw at UFC on ESPN+ 1, and a No. 1 contender fight between Joseph Benavidez and Dustin Ortiz on the same card. If the UFC was truly going to cut the division they would have already released all of these guys and not even bothered booking a title fight with a backup. I think flyweight sticks around, at least for a little while longer. Former UFC welterweight and middleweight champion Georges St-Pierre unofficially retired for the second time after beating Michael Bisping at UFC 217 last year, but I still believe he has the fire inside him to fight once more. And I think he wants to make a lot of money doing so. That’s why I believe the UFC will try and match GSP up in his return fight against Conor McGregor. Again, it’s a situation where UFC president has denied GSP would fight McGregor if he does return, but once again I don’t believe White. 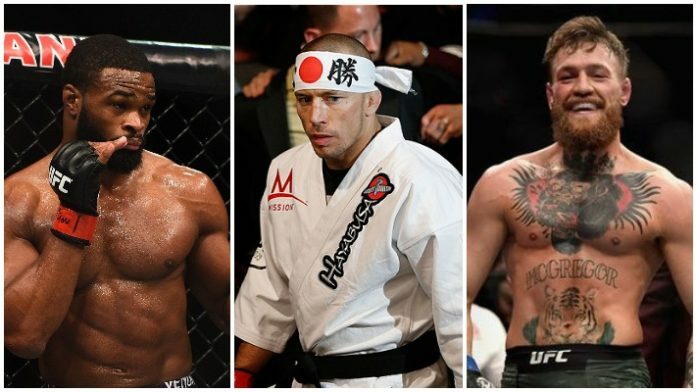 GSP vs. McGregor is one of the biggest fights the UFC can book, and it would be the perfect fight to introduce the new 165lbs weight class and belt. Although Jon Jones still has to get through Alexander Gustafsson at UFC 232, I think he will be successful in that fight and once he gets the UFC light heavyweight title back, he’ll likely be looking at the heavyweight division for marquee fights. UFC heavyweight champion Daniel Cormier is Jones’ long-time rival and after the second fight between the two was overturned to a No Contest after Jones tested positive for banned substances, I think there’s a lot of intrigue of a third fight, but this time at heavyweight. I’m not convinced Brock Lesnar even returns to the UFC in 2019, and Cormier doesn’t have many fights left in his career. If the UFC offers Cormier a third fight against Jones I can’t see him turning it down, particularly at heavyweight, where Cormier is undefeated in his career. I think we see these two rivals meet for the heavyweight title in 2019. And finally, my last bold prediction for 2019 is that the UFC will release Tyron Woodley. UFC brass has not been happy with Woodley lately, with White going on record saying how difficult the UFC welterweight is to deal with. The UFC wants to book Woodley against Kamaru Usman, and I believe that’s a bad matchup for Woodley. If he loses, I can see this being a situation like Demetrious Johnson where the UFC will give Woodley his release and let him move on to greener pastures. By the end of 2019, I think we see Woodley joining forces with his old Strikeforce boss Scott Coker in Bellator. What are your bold MMA predictions for 2019? Leave them in the comments below.